Several years ago, while visiting the tourist sites in Manhattan around the holidays with some family, we were walking on Central Park South after a stop at The Plaza. 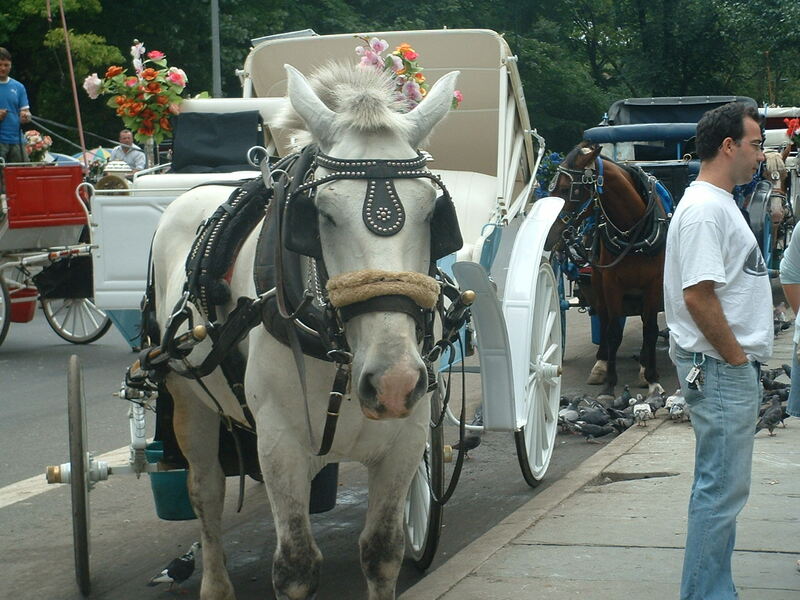 As we passed by the line of hansom cabs, my Grandmother remarked that she had never taken a horse-drawn carriage ride through Central Park. My father set about rectifying that at once, and a few minutes later they were on their way in a horse-drawn hansom cab. My dad’s spontaneity and love for our grandmother was admirable and made the day more memorable. If he visits New York next Christmastime, he may not be able to take a hansom cab ride. New York Mayor Bill de Blasio pledged, days before his recent inauguration, to do away with the hansom cabs. Animal rights activists, including the predictable coterie of celebrity actors, have long denounced the horse-drawn carriages as manifestly cruel. They’ve been aiming to have the carriage rides outlawed for a long time. De Blasio was inaugurated with much fanfare from his liberal supporters who are happy to see a Democrat in office once again. But doing away with the horse-drawn carriages is foolish pandering to a lobby polluted with fringe players and the loss of a fine tradition and lots of jobs. Cruelty to animals is terrible, but animal rights activists are never too far away from taking a hard left turn to crazy town, and outlawing horse-drawn carriages is a fringe activist power-grab that a mayor is supposed to be wide enough to sidestep. The New York City Police use horses regularly, and there are a few stables that offer horseback riding within the five boroughs. Space for horses is hard to come by in most of New York, but so is space for anything. Being generous and assuming for the sake of argument that conditions for the horses are bad, the solution is not to outlaw an industry but to improve and regulate the care of the horses. It’s not wrong to use horses to pull carts. It’s OK to ride horseback and it’s OK to ride an elephant and a camel. There are lots of animals that are not suitable for riding, but horses are alright. This is actually common knowledge and the fact that there’s a serious debate over banning the industry shows how a more extremist animal rights community has been successful in framing the debate. Luckily the carriages won’t go without a fight. What’s more, de Blasio is potentially putting hundreds of working-class New Yorkers, whose Teamsters Union endorsed him, out of work. For a politician who came into office on a platform of fighting for middle and working class New Yorkers with the nebulous pledge of ending “inequality,” putting hansom cab drivers out of work is the political equivalent of crapping in an inaugural ball punch bowl. Mayor de Blasio likely knows this, so hence the announcement during the holidays and before the hullaballoo of his inauguration. There have definitely been drivers who overworked or abused their horses. One driver was even arrested for animal abuse when found to be working a horse that had an infected hoof. But the carriages are regulated and inspected and have been under significant scrutiny for years. If we let animal rights activists start calling the shots, we’ll start on a slippery slope to becoming a city of pathetic vegetarian tree-huggers.